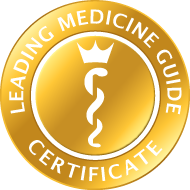 The Leading Medicine Guide alphabetically lists medical experts who are specialists in their medical fields. You can access the detailed page of the respective physician with all important information, such as contact data and focus of treatment, by clicking on the image of the requested specialist in the list below. In addition, you will find reference on personal information, such as curriculum vitae, scientific activities and publications.